Eastbury Community School students in action. 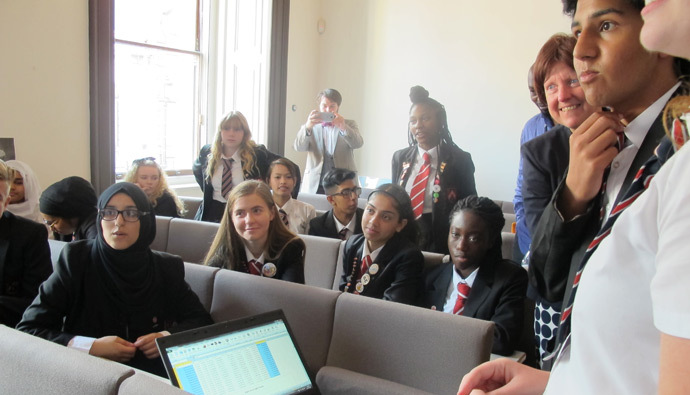 Megan Greet (Head of physics), Jamie Paton (teacher) and sixteen students from Eastbury Community School were delighted to be invited to the Royal Astronomical Society on Wednesday to demonstrate that teenagers really can carry out genuine scientific research. In partnership with the Institute for Research in Schools, led by Becky Parker, Eastbury were selected as the pilot school to analyse data from the Gaia project. This is a wonderful opportunity to enhance the enrichment work being undertaken to stretch and challenge across the attainment spectrum. 19 September 2016. We made an App! Now you can get Gaia Alerts sent to your iOS device. The Android version will follow soon. Read more We made an App! 24 May 2016. On May 16, the Gaia satellite spotted its first superluminous supernova - Gaia16apd. 17 March 2016. Gaia Alerts schools' programme launched.